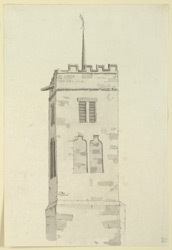 View of the west tower from the All Saints' Church in Ripley, Yorkshire, a market town situated near Harrogate. The original church was destroyed in a landslide in the late 14th century. It was rebuilt partly using the original stone.The tower is crenallated and has blocked up windows.